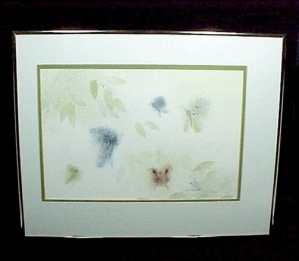 Mounted in Gold tone frame, Ivory Background, matted off center with avocado green and ivory. This one was painted prior to her marriage and is signed Jo Myers. Colors are Ivory, Avocado Greens, Blues, Grays, Mauve and Maroons. Measures approx 16" X 20" framed. Inside matting measures 10" X 15".